Greetings! Welcome to our website to report on Canadarado, a musical trade mission to inspire advocacy for Colorado's music community. This post will be first of several discussing Canadarado, its participating parties, and its importance to Colorado's musical economy. But first, let me give you a bit of background on this very special venture. 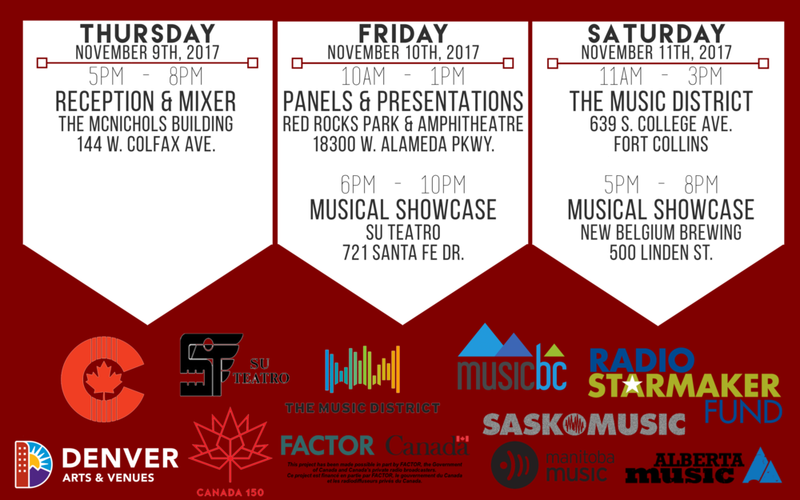 FACTOR and the Consulate General of Canada in Denver, Denver Arts & Venues, the Music District, and CU Denver College of Arts & Media are proud to host FACTOR Canada's 2017 Musical Trade Mission to Colorado, featuring bands from the western 4 provinces and Colorado. Our aim is to bolster creative and business opportunities across Canadian and Colorado musical industries and educational sectors. Cultural exchanges such as FACTOR's collaboration with Denver Arts & Venues are incredibly important in bringing international perspectives to gain an understanding of the different forces at work to improve and expand Denver's and Colorado’s musical ecosystem. We're thrilled to be able to experience this important fusion of music, ideas, and culture. For more background, feel free to click around through the pages of this website. We especially thank our partners The Music District and CU Denver College of Arts & Media for helping to make this event come to life.